Have you ever seen 500 people stunned into a complete and devastated silence? 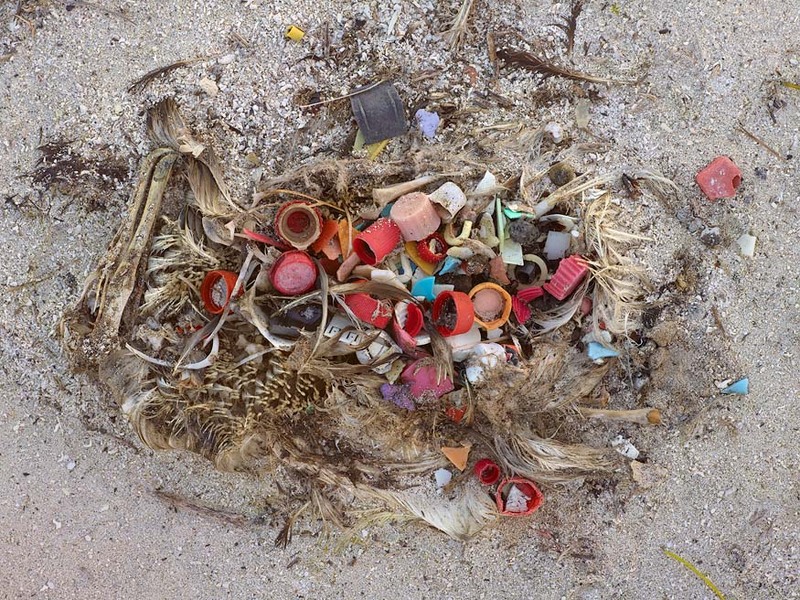 Photographer Chris Jordan shared a sobering tale of his journey to Midway Atoll with the Poptech conference on Thursday, where he captured horrifying images of baby birds killed by plastic from the Pacific Trash Gyre. The crowd, which had been listening to a day of Big Ideas, was dumbstruck. As Jordan explained, it’s not a floating garbage dump as you might imagine it. Most of the debris is made up of tiny pieces of plastic and other litter which is floating in a suspension beneath the surface of the water. Some researchers have found that water in the Gyre holds six times more plastic molecules than phytoplankton, the single-celled organisms at the bottom rung of the marine food chain. Jordan traveled to Midway Island, near the site of the pivotal World War Two naval battle, to document the death of baby albatrosses on the island’s nature reserve. The birds scoop the plastic out of the water and feed it to their babies. There should be this type of consumer awareness message on television and the internet because people simply don’t know. All they know is that their ipod is working perfectly. Green Peace is a noble cause, help fix it…. For a start, ban red plastic. The photos illustrated show that most of the plastic stomach contents are red. The krill that adult albatrosses capture and fly back to Midway is red. The adults see the floating red plastic, think it is krill, catch it and fly back to Midway where they feed it to their chicks. The chicks then starve to death with a full belly – of red plastic. This is awful, we as a whole should be ashamed. Poor animals. While in Peru,I read an underground news item about trash dumping directly into the Pacific Ocean,..I saw pictures of semi trucks unloading their stinky cargo ,.,.these trucks belonged to their government. On top of this supposedly everyone on the planet tests positive for some level of plastic poisoning. The plastic out there just breaks into smaller pieces of plastic and never really decomposes, so all the beaches in the world have bits of plastic as well as sand. The Pacific Gyer is not a fun subject, definitely makes me wonder what of my trash is out there floating. The article refers to a suspension of tiny pieces of plastic, yet the pictures show large, intact ones. The images clearly show a different phenomenon than referred to in the article, which says “…it’s not a floating garbage dump as you might imagine it.” These dead birds appear to have fed at just such a dump. Where and what is it? Wow. How can we clean it up? Can nets sweep the area? Is there a foundation dedicated to trying to clean this up? Being able to help would make me feel a bit better. Any ideas? To Dusan — A large percentage of the trash has broken down into tiny fragments, but there is still plenty of it intact. Sad but True ! We will soon see a lot more junk coming to light in your own back yards while all the good things in life start to disappear for good ! Humans with their never ending creativity will seal the fate of our ” Plan-Net ” for good ! Not realizing we are the biggest wasters of any thing including fresh water ? We are surrounded by 2/3 of water ~ In which life took birth ~ Soon the Oceans will go acidic and CO2 rich ~ Killing millions living under water ? Leaving the Overlanders to richer concentrations of CO2 and muck to live on ! While our scientists go looking for traces of frozen water on the Moon and else where in the Galaxy ??? Where no form of ” Living Life ” has ever existed or exists ! Except in Fiction & Mind ! Sad but True ! Nobody is willing to take the responsibility ! While the blame game goes on ~ Blaming the other for it ! Old profound saying ~ ” All Good Things Come To An End ” ! Warm Regards ~ Enjoy The Warming laced in Plastic ! Staging dramatic “photographic” images without accompanying analysis and study hurts your cause more than you think it helps. Less dramatic, but more realistic indications from this study written up in Veterinary Pathology indicates no evidence of 1) injested plastics being the result of mortality, and 2) no indication that baby albatoss are being force-fed a steady diet of cigarette lighters and bottle caps. There is substanial evidence pointing to other human-activity mortality issues such as lead poisoning and vehicular incidents; but these don’t allow the advocacy brilliant technicolor dramatic pictures accompanying no analysis. Sorry guys, stick to the facts and we may have a dialogue. We (me and several children) have made green boxes, set them in 5 places – a cinema, cafe, ect. to collect the PE caps for recycling. I can show to my small colleagues who might be saved far away in the sea. @slzebell – Keep in mind that the abstract you reference was from almost 20 years ago and even they note that they looked at one year and it was a lower than average year. During my research at Midway and Kauai, I have personally had vets declare plastic ingestion/blockage of the digestive tract as the cause of death in several Laysan Albatross chicks. The photos Chris Jordan took are not sensationalizing a trivial issues – plastic in dead albatross chicks is not rare, it is the norm. In late summer/fall, those islands are littered with dead chicks and plastic. I am so glad that his work is bringing this issue to the mainland audience. I think this is an important issue. Especially disturbing to me is that much of what is in the gut of the pictured birds looks like it could be medical waste – test tube caps and so on. At the very least, the stuff looks fairly homogeneous, which would seem to me to be inconsistent with a generalized plastic waste gyre in the Pacific. The question is, is the stuff in the pictures from some sort of (possibly) illegal localized dumping? Dusan, most of what I see in the photos is domestic waste (bottlecaps from soft drink bottles, a cigarette lighter), not medical. Now, for a quick glimpse of the scale of the problem. The US EPA has reported that American citizens in 2007 generated, per person, about twice as much trash of the sort that winds up in the North Pacific Gyre (“municipal solid waste”) as the citizen in 1960. In that time, the US population has risen from 180 million to more than 300 million. Yes. Merely to return to 1960 trash-contribution levels, each US citizen must, on average, reduce contributions to the waste stream by at least two-thirds. What disturbing photographs, they must been be seen by as many people as possible . please send them to schools and show them to the pupils so they can see just what is happening to our planet and our wildlife . This is absolutely shocking and not acceptable. I will send this email on to my friends and colleagues in the hope that they will do the same, and so may the protests continue. It is shocking, plastics should not be used for food wrap, it has health implications for us who use the food contained in it I am led to believe. Plastic takes years to breakdown, and if we stop using it today the damage will carry on well into the 22nd. and 23rd. centuries unless we can clean up the mess that WE have made. That will not be done …..will it? Very helpful info. Great post, I absolutely enjoy reading your post.